In Southern California, men love their cars. The weather is near perfect year round, the roads are unlike any other roads in the world, and the car community is always growing. These are just a few of the reasons Gearbox had come to be. Angus Mitchell, son of Paul Mitchell had come to realize a void in the automotive world for collectors, and creatives alike; a studio facility with room to entertain. Mitchell already being a car guy himself, decided to convert one of his warehouses he was using to store his collection into the space he had been dreaming of. Think of Bruce Wayne meeting James Bond, and they decided to build a lair together; this is what Gearbox became. A full functioning photo studio with soft boxes, and lighting hung over head encompassed the first floor, while the second floor a lounge, with a third and final rooftop terrace, and an entirely built in sound system throughout the warehouse. This was the concept and space Silvestri had the pleasure of planning opening night for. This night was going to set the tone for this studio, and Silvestri knew she was going to have to impress some of entertainment’s best producers and creative minds. To do that she kept the night industry relative. From a literal standpoint the venue was very industrial, with metal pipes and lighting showing everywhere. So Silvestri decided to tie in these raw materials with creative partners, photo activations and entertainers. This first partner that really kicked off the industrial feeling was Neft Vodka, who’s packaging resembles that of an oil can, and with the help of the always creative, The Grand Bevy, the drink menu was a hit. Guests were able to order “The Entertainer” or “The Planner” or take part in a whiskey tasting on the second floor mezzanine. Silvestri’s partners at Red Carpet Systems created an unforgettable photo activation with 8 feet tall metal letters of the GearBox logo on the first floor. The letters were positioned to take up a corner of the venue, and the built in lighting system for photoshoots was utilized as well as showcased for guests enjoyment. Finally the entertainers. Silvestri had envisioned women in metal costumes walking through the event, and upon conception and reviewing with the client, Angus Mitchell had just the solution! At a show in Asia a few years previous, Paul Mitchell had a similar vision of women adorned in metal. Lucky for Silvestri, the costumes, constructed by the same designer as Lady Gaga, now lived in a West Hollywood costume shop, For the Stars Fashion House. This rough and glamorous style was what set the tone for the night, and as guests arrived they were only getting a taste of what to expect. Imagine, pulling into the venue, and the sound of gears turning being to grow, the car is approaching smoke, and an active GearBox logo with the gear rotating around the “G” in line with their website branding, is lighting up the path to the valet. This is what guests had first encountered. 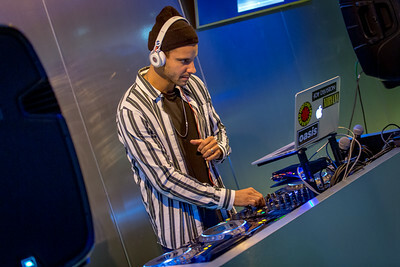 As they made their way inside the venue, guests were offered a Grand Bevy cocktail branded with the GearBox logo, and submersed into the venues sound system, with celebrity DJ Devin Lucien mixing away. Throughout the night, some of the industry's top creatives made their way onto the step and repeat for first impressions of the venue including Maye Musk, Jolina Mitchell, Emm, Savannah Kennick, Ali Levine, Pierre Abena, Melanie Mar, and Walter Emanuel Jones to mention a few. As the night was peaking, entertainers started crawling out from the shadows. First the crowd heard from an electric violinist who made her way through the crowd starting on the second floor where she then accompanied a cyr wheel performer. These acts showed off not only how the space could be utilized, but also how instruments sounded throughout. Next up was new and fresh talent, Lexy Panterra who sang for the crowd, again showing off the venues built in sound system. 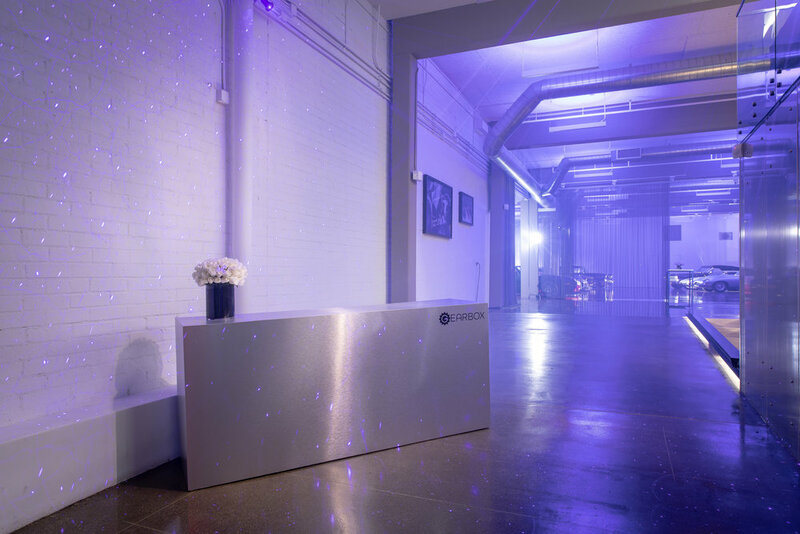 From there, guests were then welcomed into the space by Angus Mitchell and John Paul Dejoria where they told the story of conception to reality and invited guests to really explore the venue to see why they should come back. As the night wound down to an end, guests were given a gift bag consisting of a branded water bottle, Paul Mitchell products, and a thank you card with the studios information. Silvestri left the guests with a taste for excellent food from partner Lucques Catering, cocktails unlike any other from the Grand Bevy, GearBox branded desert chocolates from Compartes and beautiful flower arrangements throughout from the Empty Vase. Each tangible and delectable detail guests had interacted with kept Gearbox on their mind, all thanks to Silvestri’s clever branding tricks she has made her signature throughout the years, from cocktails to the napkins they’re served with. Not to mention the deserts and even the photo activations. When launching a brand, there is no one who can replicate the style of Silvestri. 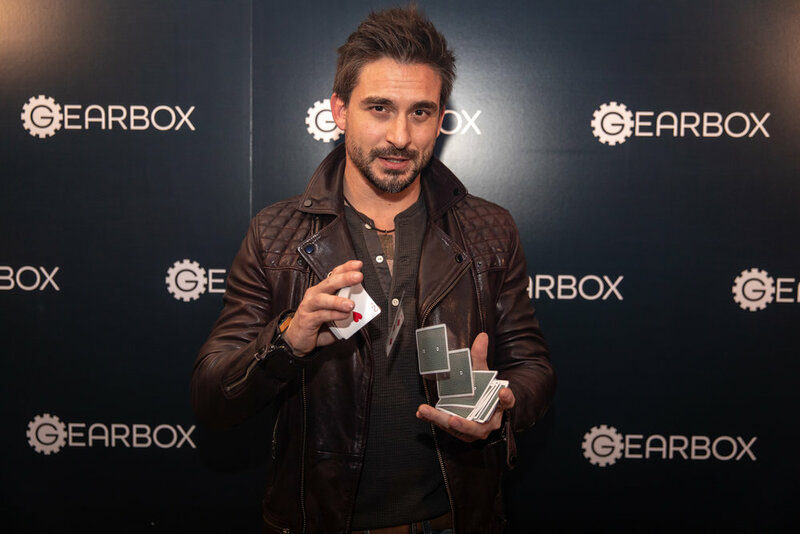 Photo courtesy of Gearbox LA. Photography by Ted7 and Getty Images. Videography by Advent Films.